The accounting equation reflects that one asset increases and another asset decreases. Since the amount of the increase is the same as the amount of the decrease, the accounting equation remains in balance. The totals tell us that the company has assets of $9,900 and the source of those assets is the owner of the company. It also tells us that the company has assets of $9,900 and the only claim against those assets is the owner's claim. The purchase of equipment is not an immediate expense. It will become part of depreciation expense only after it is placed into service. We will assume that as of December 3 the equipment has not been placed into service, therefore, no expense will appear on an income statement for the period of December 1 through December 3. As you can see, ASC's assets increase and ASC's liabilities increase by $7,000. The totals indicate that the transactions through December 4 result in assets of $16,900. There are two sources for those assets—the creditors provided $7,000 of assets, and the owner of the company provided $9,900. 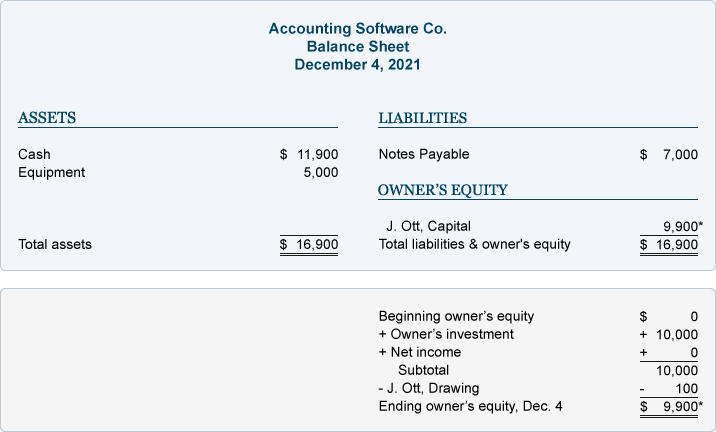 You can also interpret the accounting equation to say that the company has assets of $16,900 and the lenders have a claim of $7,000 and the owner has a claim for the remainder. The proceeds of the bank loan are not considered to be revenue since ASC did not earn the money by providing services, investing, etc. As a result, there is no income statement effect from this transaction.